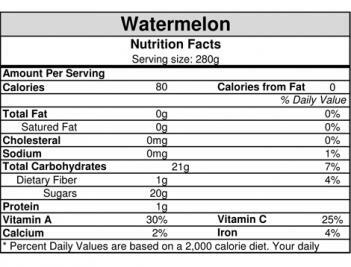 According to the USDA, watermelon consumption increases free arginine and citruline which help in the maintenance of arteries, which increases blood flow and heart health. 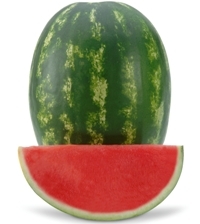 Watermelon also contains higher levels of lycopene than any other fruit or vegetable. Lycopene is thought to have antioxidant capabilities. 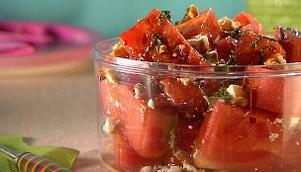 A serving of watermelon contains high levels of Vitamin A,B,C and beta-carotene. In a small saucepan, whisk together the balsamic vinegar and sugar. Cook over medium heat until reduced by half and syrupy – about 4 minutes. Stack 2 pieces of watermelon on each plate and drizzle with the balsamic reduction. Sprinkle with feta cheese and mint and serve. © 2009 Coastal Growers LLC. All Rights Reserved.